Before I begin this blog post, you need to be aware of one thing: I’m a walking cliché. Now that that’s out of the way, let me continue. Ninety years ago today Marilyn Monroe was born. Actually, that’s not true. Ninety years ago today the girl who would become Marilyn Monroe was born. I’m not going to go through the early life of Norma Jeane Mortenson except to say that it was far from ideal and it unquestionably left an indelible mark upon her. Any of the countless books or websites about her can fill you in if you aren’t already aware of her fascinating but ultimately tragic life. Rather than analyse and hypothesise about the girl nobody wanted who became the woman everybody wanted a piece of, I’m just going to write about my experience of Marilyn and how she impacted my life, even if I was born almost twenty years after her death. In December 1986 Elton John recorded a live version of his 1973 hit Candle in The Wind, which was subsequently released as a single in 1987. It peaked in the charts at #5 in 1988 (the music industry, and everything else, was a lot slower in those days). Even without the help of YouTube I can remember the live video that accompanied it, with Elton dressed in 18th Century regalia as he played to the huge arena. I can’t for the life of me remember which TV show I saw it on but it had to be one of the two Irish stations at the time or on the BBC. Regardless, it left a mark on 8 year old me and I liked it, though I recall it leaving me with a sense of sadness that I couldn’t quite fathom at the time. I’ve said it before and I’ll say it again- I was an odd child. I asked my mother what the song was about; her reply, full of truth but lacking in detail: “About a woman who died”. This uncertain sadness worsened inexplicably and hung inside me like a coat beneath my skin for a while but no doubt another song came along or something else happened and I rapidly got on with my little life, the way children do. Yet, she was there. Somewhere inside me I was becoming aware of her and it was a step beyond the collective unconsciousness, something slightly more direct. Half a decade later and my world was different. It was the mid-90s and I had grown from an odd child into an awkward teen. I still surrounded myself with books and writing and dreamt of escape from the banality of rural town life, though I was grateful that my hometown of Enniscorthy at least had a book shop and a café or two. Like a lot of teens, I hated the place I was living in, though of course with adult eyes I have a new found fondness for my pretty hometown in the Slaney Valley. 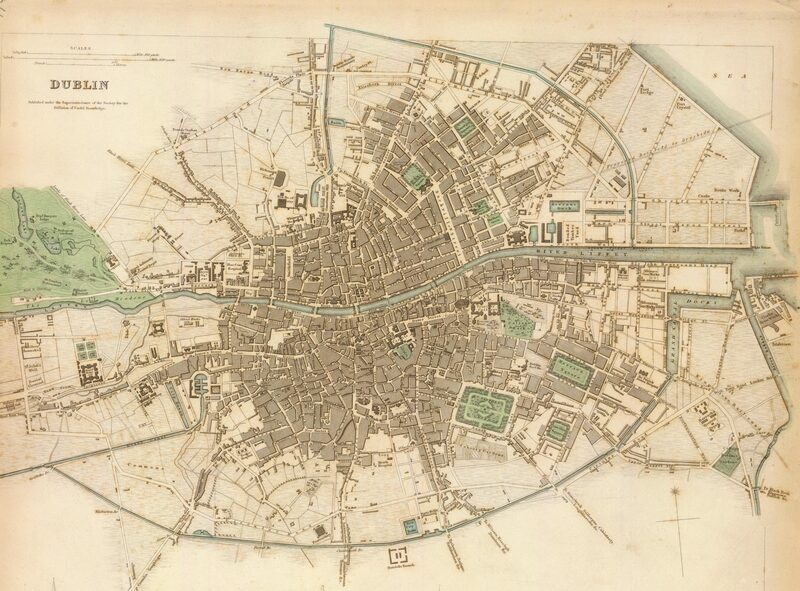 During this period my mother would drive to Wexford town, around a half an hour journey at the time. The reason for this was simple- they had a Crazy Prices and we did not, so it made financial sense to make the trip once a week and do the grocery shopping there. While there I’d inevitably end up in one of the book shops, an envious eye on the countless tomes that I couldn’t afford. On one such visit I paid my usual pilgrimage to the bargain table, rifling through the clearance stock and special offers. Truth be told, I was probably looking at the large yellow sticker price tags before I even read the title and it was this practical approach to book buying that brought Marilyn back into my life. A slim hardback with the image of a glamorous and sultry woman on the cover, looking very old Hollywood. I picked it up to take a closer look. Marilyn Monroe. The coffee-table book was mostly images and quotes from this woman of whom I knew very little at the time, as well as blocks of text with the basic details of her life. I read one quote, then flicked a few pages and read another. I was hooked immediately and wanted to read more, even though the words themselves are now long forgotten to me. There was something touching and sweet about this very beautiful woman and the alleged words she had spoken at some point in the past. I made the purchase and read the book on the car ride home. When I got home I read it again, finding a favourite quote instantly, only for yet another one to take its place in my hierarchy of Marilynisms. The scant information I garnered from the slim publication was enough to whet my appetite, and little did I know it then but it would become almost insatiable. This was still the pre-internet age, and while it technically existed it wasn’t the internet as we know it today. People didn’t have computers, let alone have access to the internet. The local library, which had been re-homed and updated in the early 1990s from its original building in the Market Square to the old Vocational School building on Lymington Road, proved to be invaluable in my quest for more information. Sure enough, in the biography section there were several books all about Marilyn. I took out as many as I was allowed to (three if I’m not mistaken) and set about consuming every fact about Norma Jeane Mortenson that I could. Her life of struggle and overcoming obstacles, being vulnerable but also full of the strength to continue, her general ups and downs; all of these elements made her hugely appealing to me as an angst-ridden teen. To be honest, they probably still do. Some books focused on her childhood and ended with her rise to fame, others explored the murkier side of Hollywood and conspiracy theories, some happily allowed her to be the dumb blonde but mostly they struggled to portray the real woman behind the icon. I didn’t care really; I just wanted to know more and more and more. When I’d exhausted all the resources at the library I set about finding more books about Marilyn. The local bookshop had a few and I utilised the weekly shopping trip to Wexford town as best I could. Throughout my teen years I had a part time job of some variety, and at this particular stage I was working at a local “big house” in the gardens. The work was nice enough and the people were decent; I earned £10 for my day’s work and got a freshly baked scone with homemade jam and tea for my morning break. Just to reiterate, this was 1990s not 1890s, though it almost sounds like it. Anyway, one particular day I remember finishing my duties and rushing down the road into town, to the book shop. There waited a large hard-backed book (Bernard of Hollywood’s Marilyn) with a beautiful slip cover that I was just dying to buy. It was on special offer for £10 and as I stared at a green hewed James Joyce bank note in my hand, I knew it was the best day’s work I’d ever done. Again, this was mostly a book of images with minimal text but in the days before Google Image there were few other ways of obtaining pictures. My collection of books began to grow and what little money I earned went to bookshops and charity shops with second-hand book sections. My interest naturally went beyond the literary, and I wanted to watch all of Marilyn’s old films (or at least the ones I could find on video) but it was always her private life (if it can even be called that) that interested me the most. There was something elusive about her, a woman I never knew, that drew me in unlike any other person previously had. The years rolled on and Marilyn seemed to become a permanent fixture in my life. 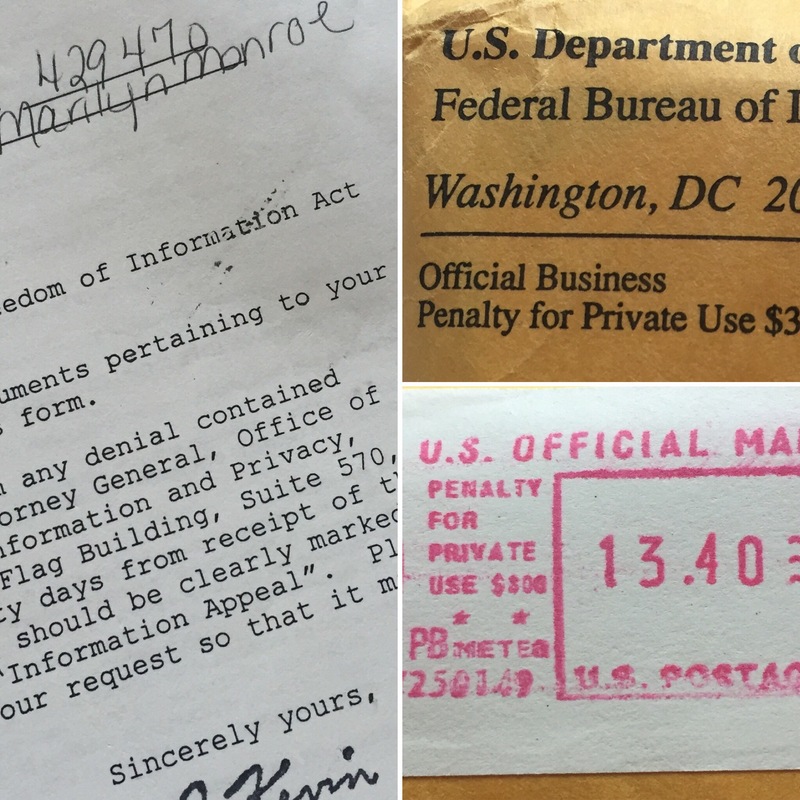 In 1996 I requested the FBI files on Marilyn Monroe under the Freedom of Information Act. Today I could probably find out everything in those files by a simple online search but then it involved writing a letter to request the files and then waiting. When they eventually arrived, to much furore I should add (it’s not easy to explain to your parents why the FBI are sending you a huge file in the post) a lot of the information had been redacted. In fact, there was probably far more information in the books I had read rather than the files I received. None the less, they were interesting and I was delighted to have another missing piece in my process of knowing the unknown. I didn’t realise it at the time but I was, in a way, researching Marilyn. Now in my mid-to-late teens I was preparing to sit my leaving certificate exams in the summer of 1997. For my English paper I prepared an essay about Marilyn and JFK, rote learning it and hoping that it stuck. Thankfully on the day there was a selection of titles that I knew I’d be able to make my prepared essay work with, and I spewed it out onto the page. English was possibly my favourite subject in school, though I generally melded into the background throughout most of the post-primary education. I was rarely in trouble but then I was rarely anything at all. I just wanted to get in and out of school as quickly as I could. Towards the end of the summer the exam results were announced. It was a warm day and entrance hall to the otherwise empty school was packed with boys awaiting their fate. My English teacher for the final year, who I liked but didn’t necessarily have much of a connection to, was in the hallway when I opened my results. Apparently, it was a particularly tough year for the English exams (two separate exams for those not in the know). I did quite well and was, allegedly, one of only two pupils to get a high grade in English that year at my school. The look on my teacher’s face was priceless and I still remember it vividly. He was absolutely shocked that I had done so well, I’m guessing because I never did or said much during school time itself. My other subjects might not have fared as well but getting that result in my English exam gave me a confidence boost that I desperately needed, and I attributed it primarily to my essay about Marilyn and JFK. I’m still proud of that to be honest and it reinforced within me a desire to keep writing. Even today I still can’t pass a book about Marilyn without picking it up for a browse or if there’s a documentary on that I’ve seen countless times I’ll still watch it. My adult life makes space for her and though I may not be as overtly obsessed as I was in my teenage years I’m still enthralled by her. I think, at least anecdotally, that many artists, whether they be painters, writers, or anything else, are attracted to tragedy in some shape or form. Even more so when that tragedy befalls the beautiful, even if they usually have a hand to play in their own downfall. Today we’d probably say Marilyn was a product of the society she grew up in, or that she was affected by the trauma in her life and later played them out. Perhaps she was looking for the Other, or maybe it was all behavioural. It doesn’t really matter anymore, as the answer will always be obscured by time, truth, reality, and Marilyn herself. Just like the world loves to analyse her, I could try to decipher my own attraction towards to her but the outcome would still be the same. What I do know for sure is that for few or many reasons she has played a large part in my life and has taught me lessons along the way. For that I’m grateful to this woman I never met, who was long dead by the time I was born, but to whom I feel connected. Thank you, Norma Jeane. Thank you, Marilyn Monroe. Happy 90th birthday.